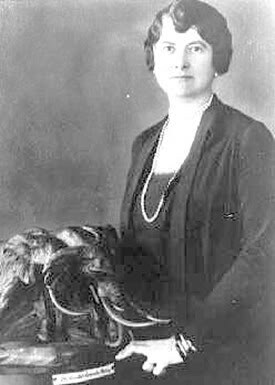 Mary Jobe (1886–1966) explored the Mount Sir Alexander area in 1914 and 1915, on expeditions guided by Donald Phillips of Jasper. The so-called Jobe-Phillips map and her account of their explorations was published in the American Geographical Society Journal, 1915 — the only detailed map and description of the area until boundary surveyors visited the area in 1922. Tall and strong, Jobe was a woman of determination and great endurance. Phillips may have proposed marriage to her on a visit to New York, where she was a teacher. In 1924, she became the second wife of Carl Akeley (1864–1926), an explorer (who hunted in Africa with Theodore Roosevelt), natural scientist, sculptor, inventor, and “father of modern taxidermy” (in 1885 he stuffed Jumbo the elephant after it was hit by a train in Canada). On their first visit to Africa in 1926, Akeley died of disease in the remote mountains of the Congo. Jobe remained to take charge of his work, collecting specimens, and when she returned to the United Stated in 1927 she succeeded her husband as advisor in the development of the African Hall at the American Museum of Natural History in New York. In the same year, King Albert of Belgium awarded her with the Cross of the Knight, Order of the Crown, in recognition of her courage and service. She revisited the Congo in 1946 to study the development of the parks system. Between her travels she lectured and wrote several books on her African experiences. She died in 1966, never returning to the mountains of western Canada.